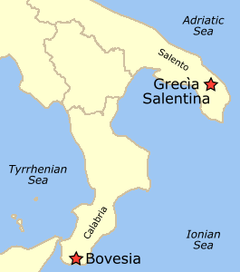 The Calabrian dialect of Greek, or Greek-Bovesian, is the variety of Italiot Greek used by the ethnic Griko people in Calabria, as opposed to the Italiot Greek dialect spoken in the Grecìa Salentina. Both are remnants of the Ancient and Byzantine Greek colonization of the region. They are frequently lumped together as Italiot Greek (Katoitaliótika), Grecanic or Griko, but they have different histories. However, Calabrian Greek has never experienced an extensive growth period during its history. It has ever been used only in basic day-to-day communications without ever playing a significant role in the fields of administration, literature or ecclesiastical matters. Around the mid-16th century, it had disappeared from the fields of Petrace, particularly from the high valley of Diverso and Tasi. During the 17th century the regression spread to some valleys in the western side of Aspromonte near the Straits of Messina, such as the Catona and Gallico Valleys. During the 19th century, it was lost in some villages like Pentedattilo, Africo, Brancaleone, Motta San Giovanni, Montebello, and San Lorenzo, on the Ionic side of Aspromonte; and in the early 20th century, thatspread to the towns of Palizzi, Staiti, Cardeto, Roccaforte del Greco, Amendolea and Condofuri. Calabrian Greek has a lot in common with Modern Standard Greek. 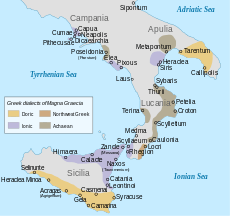 With respect to its origins, some philologists assert that it is derived from Koine Greek by Medieval Greek, but others assert that it comes directly from Ancient Greek and particularly from the Doric Greek spoken in Magna Graecia, with an independent evolution uninfluenced by Koine Greek. In 1970, the group established a cultural association named La Ionica and the pamphlet became a magazine, which contained poetry and prose in both Italian and in Greek Calabrian. The same association established contacts with Greek speakers of Grecìa Salentina aimed at creating the UGIM (Union of Greeks of South Italy) to protect the region's bilingualism jountly and to demand formal state recognition in such areas, such as bilingual road signs. The dialect has never been used on television. The region of Calabria has encouraged the education of the dialect in schools, along with what already happens regarding Albanian, thus promoting bilingualism. In 1993, the region also created an Istituto Regionale Superiore di Studi Ellenofoni (Regional Institute of Advanced Greek Studies), based in Bova Marina. ↑ Tom Mueller, Calabria Grecanica, article at madeinsouthitaly.com, accessed 31 March 2015: "In the last 30 years alone, five Greek-speaking villages have been abandoned. Though no one knows exactly how many native speakers remain, they cannot number much above 2,000." ↑ Hammarström, Harald; Forkel, Robert; Haspelmath, Martin; Bank, Sebastian, eds. (2016). "dialect of Apulia-Calabrian Greek". Glottolog 2.7. Jena: Max Planck Institute for the Science of Human History. ↑ Grendler, Paul F. (2004). The universities of the Italian Renaissance. JHU Press. p. 78. ISBN 0-8018-8055-6. Boccaccio persuaded the commune to appoint Leonzio Pilato, a Greek from Calabria, to teach Greek, the first such professorship in western Europe.